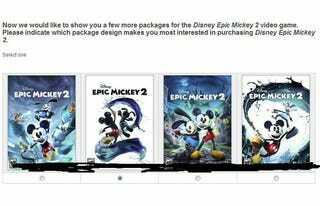 An online newsletter from Disney has again confirmed long-circulating rumors about Epic Mickey 2, and says the game will release on PS3, Xbox 360 and Wii in Fall 2012, reports the site StitchKingdom.com. The original Epic Mickey, released in 2010, was a Wii-only title. Epic Mickey 2 will feature cooperative multiplayer play, according to the newsletter. Destructoid reported the same rumor, also coming from a marketing survey, back in August, though at the time no launch window was given. The co-op play will apparently be a two-player split-screen mode, in which one player plays as Mickey and the other as Oswald the Lucky Rabbit, who was Walt Disney's first cartoon star. The Wii U is to launch sometime in the last half of 2012. It'll be backward compatible with original Wii titles and peripherals.